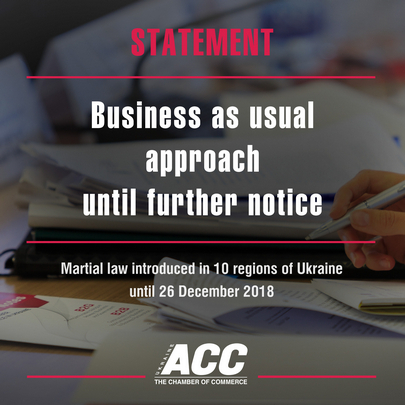 Martial law has been introduced in 10 regions of Ukraine for a 30-day period until 26 December 2018. This is the first time that martial law has been introduced in Ukraine. We have not seen any initial disruption in business operations due to martial law being introduced, but are closely monitoring developments. Our team and lawyers have studied the legal wording we are now monitoring and working closely with authorities to understand the practicalities of the martial law. We have launched a special taskforce to monitor, liaise with authorities and support members. We are monitoring commercial vessels coming in and out of the Mariupol and Berdyansk ports in the Azov Sea. We are in touch with the US embassy and will be sharing any security advice changes. We do not expect any IMF program delay due the Martial law. We are advising a business as usual approach until further notice.